Andrew Ganz October 5, 2018 Comment Now! It’s probably cold down here in the bottom of a disused quarry, with the wind howling and rain approaching Biblical. I can’t say for sure, but I turn up the 2019 Toyota 4Runner TRD Pro’s seat heater anyway. The trail guide yelling through the wind at me from the top of a slick, rock strewn hill is drenched, but he’s determined to get the 4Runner out of the muck and back to base camp. Worst case, we could easily walk back to the heated tent where Toyota has spread out some granola bars and cans of Dr Pepper. I’m in the Bridgeport Off-Highway Vehicle Park about 30 miles west of Fort Worth, Texas, not exactly stranded in the wilds. The trail guide has abandoned the 4Runner’s crawl control system, which uses the brakes and stability control to lope this lumbering, old-school SUV along at a snail’s pace. The Falken Wild Peak tires underneath are so caked with North Texas clay that, as Tim Allen liked to say in “Home Improvement,” more power is the only thing that’s going to get us back to civilization. There’s Dr Pepper up there! Finally, with the bright blue 4Runner’s throttle mashed to its muddy carpeted floor mat and its rear differential locked, it bounces up the hill and we cheer. The trail guide climbs back in, the muck on his pants filthying up the interior even more. The reason for my trip to this off-road park is to sample the latest round of updates to Toyota’s TRD Pro lineup. 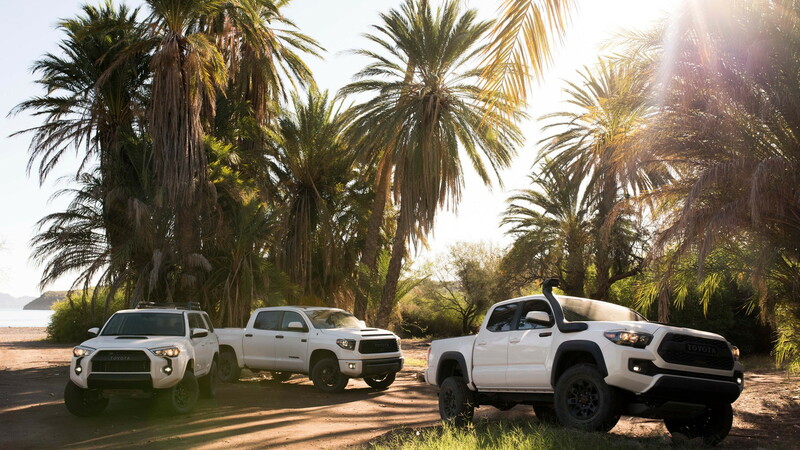 Its Tacoma and Tundra pickup trucks and its 4Runner SUV don’t look different than last year, but all three trade Bilstein shocks for new dual-reservoir Fox units that give each a distinct flavor. Or maybe it’s the Lexus of four-wheelers. There’s no masking the Tundra’s girth. It’s a full-size pickup meant for hauling trailers or a bed full of mulch (or maybe just the kids to school). There’s also no hiding the Tundra’s age. Its design dates back about a decade, and the shiny silver plastic that adorns its interior looks more like a 50-pound Panasonic plasma TV than a sleek new 2160p OLED display. 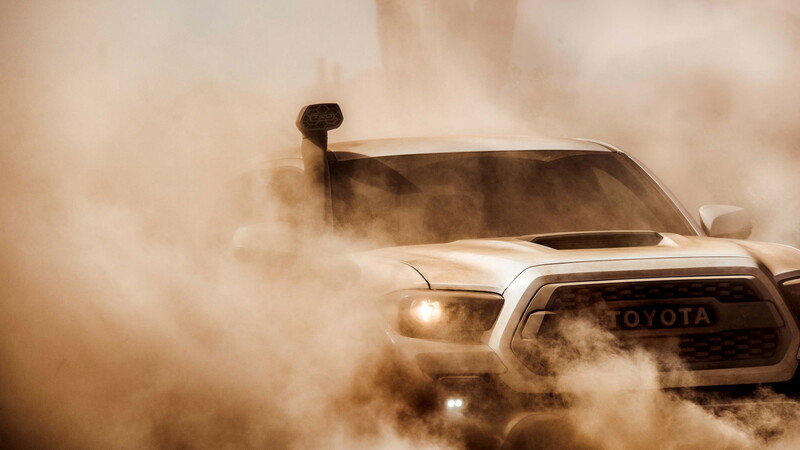 With two passengers and a tank of fuel, the Tundra TRD Pro weighs about three tons. 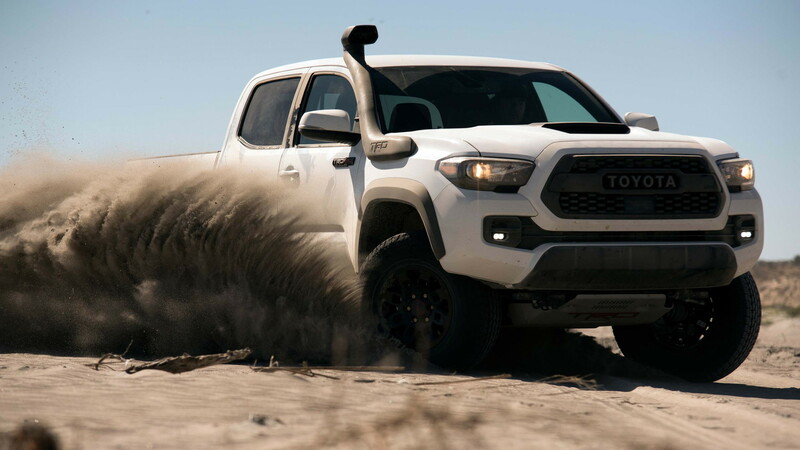 Toyota tuned the Fox shocks underneath the 2019 TRD Pro to swallow bumps nearly as well as they do on the king-size Ford F-150 Raptor, albeit without that desert-runner’s massive ground clearance. It glides over smaller bumps, even though it begs for better tires than the Michelin LTX A/Ts wrapped around its hand-polished BBS alloy wheels. It’s almost a shame to get those wheels muddy, but I do so in the interest of science...at velocity...sideways across a high-speed course designed to replicate desert driving. With stability control switched off, the Tundra defies its size thanks in part to the lack of weight over its rear axle. It’s a blast to drive. It's also shockingly expensive at about $51,000 to start. 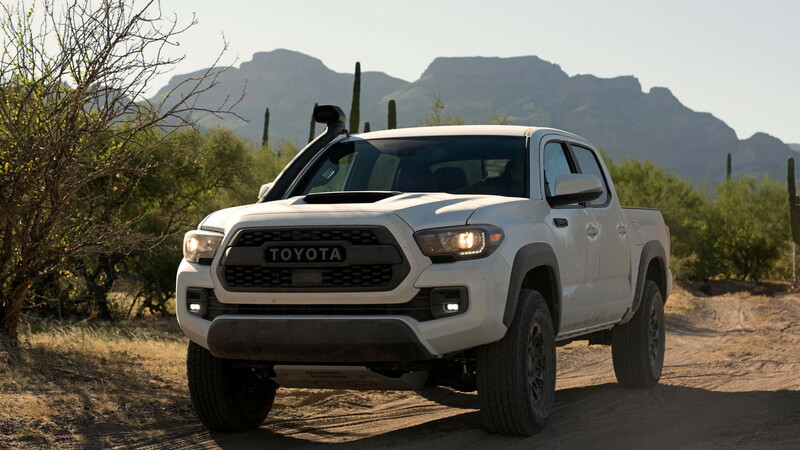 The smaller Tacoma TRD Pro’s shocks may also say Fox on them, but the smaller of Toyota’s two pickups is a different animal entirely. Its suspension is firm and uncompromising. Certainly there’s plenty of wheel travel, but the Tacoma is less eager to stuff its tires into its wheel wells than the gentle giant Tundra. That stiffness makes the Tacoma more fun to whip around at higher speeds than the Tundra, but it jostles passengers. Given the Tacoma’s tight interior, that means a lot of bouncing around in not much space. Unlike the Tundra, the $43,000 Taco has a locking rear differential. Tap a button and the rear wheels do their own thing while in four-wheel drive low-range, a boon for rock-crawling and getting out of the muddy situations I saw at the off-road park. The surprise of the day is the 4Runner TRD Pro. For about $44,000, it’s well-equipped for battle. Its Fox shocks are as gentle as those in the Tundra, but the 4Runner’s coil-sprung rear suspension provides it with vastly better driving dynamics than the leaf springs in the pickups. The 4Runner is no nimble machine, but it’s significantly smaller than the other two, which means it can snake down a tight trail with relative ease. 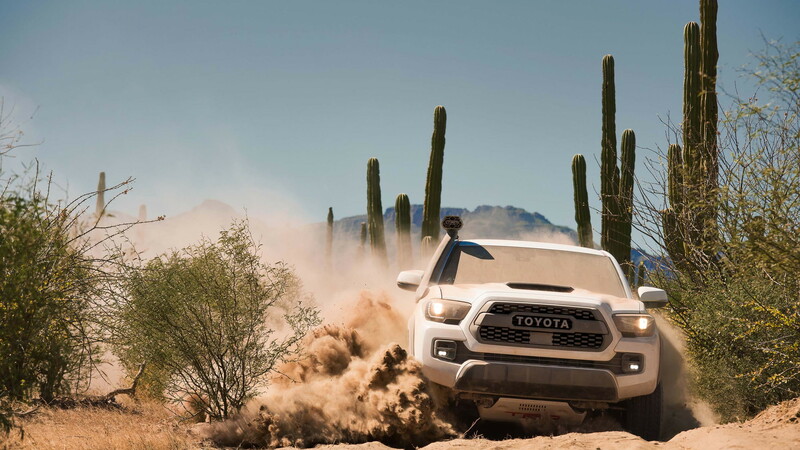 Like the Tacoma, the 4Runner has traction control modes for most situations and a push-button rear differential lock. Its transfer case is even operated by an old-fashioned lever rather than a knob that might as well control the air conditioning system. Maybe it’s the 4Runner TRD Pro’s impressive momentum game that helps it scrabble up a rocky hill that endears it to me so quickly. As an out-of-the-box exploration rig, it’s hard to imagine a better all-rounder. The latest Jeep Wrangler Rubicon has a fancier touchscreen and will ultimately go further, but it’s costlier with equivalent options and still a chore to drive around town. I’ll have the 4Runner TRD Pro—with a Dr Pepper in its cupholder.